I would like to thank my friend, Lisa McAuliffe, for offering me the opportunity to share a booth with her at the All-Ireland Cultural Society’s 68th St. Patrick’s Day Celebration! 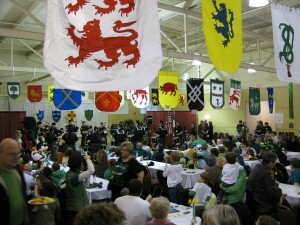 www.oregonirishclub.org It is a fantastic event, held every year, most appropriately, on the 17th of March! So many friendly, happy people, drinking, dancing and enjoying good food and each other’s company! Being Irish is the BEST!! My mom and I had a great time talking to people and listening to live Celtic music. Not to mention… the Irish dancers were outstanding!! Even though I learned of the event only two weeks prior and I wasn’t stocked with many Celtic, or even, green pieces, we still managed to sell some jewelry. Next year, though, I will be much better prepared. Come join us! Erin Go Bragh! !